I currently live in New Zealand, and am originally from the UK. I did my undergraduate studies in Natural Sciences (Astrophysics) at Cambridge University, before going on to a Ph.D. in astronomy at Edinburgh University, studying the structure of the Galaxy through low-mass stars. I then spent two and a half years in the US for a NASA postdoctoral fellowship at the American Museum of Natural History in New York City. I moved to New Zealand in 2006, were I worked in meteorology for three years. 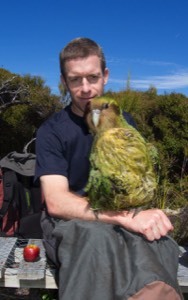 I switched to a career in ecology via a Ph.D. in Conservation Biology at the Victoria University of Wellington. My Ph.D. focussed on kiwi, with much of my research undertaken at Zealandia nature reserve in Wellington, where I also worked as a tour guide and volunteer. I currently work as a scientist at the Department of Conservation in New Zealand, specialising in kakapo and takahe. You can follow my research and work on Twitter: @takapodigs. I have a fascination with astronomy and a passion for wildlife and conservation. Other interests include (wildlife!) photography, mountain biking, tramping (hiking) and camping.